Have you ever grabbed a gift card as a last minute birthday or holiday treat? You aren't alone. 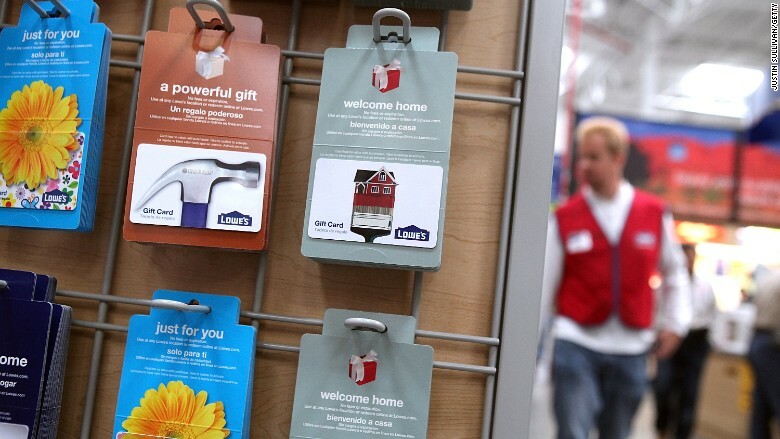 Gift cards are booming in the United States, and they're catching on around the world. They have become so popular that they're no longer seen as a thoughtless gift. For the past eight years, those plastic cards have actually been the most requested gift in America, according to surveys by the National Retail Federation. "The beauty of why gift cards keep growing is they are branded. It's not just giving someone a check or cash," says Ken Murphy of Standard Life Investments who analyzes the retail sector. Roughly two billion cards were purchased last year in the U.S., according consulting firm A.T. Kearney. The typical gift card amount is around $50 for a restaurant or department store. The company behind those cards: The explosive growth in gift cards has been very good news for Blackhawk Network Holdings (HAWK). In 2010, the company sold about $580 million of them. Last year, it did just shy of $1.5 billion. Its stock trades under the ticker symbol "HAWK." While it isn't a household name, you've likely seen its products. Blackhawk is responsible for most of the gift card kiosks in grocery and convenience stores. "Blackhawk is doing all the right things," says Ramesh Siromani, a partner at consulting firm A.T. Kearney. The company is expanding internationally into Europe and China. Investors see a lot more potential for Blackhawk as gift cards catch on around the world. There are also new uses for the cards such as companies giving them out as rewards for meeting a health or sales goal. In June, Blackhawk acquired Achievers, which specializes in "employee recognition and rewards solutions." It's one of the reasons Blackhawk stock is up 14% so far in 2015 and nearly 60% in the past year. Blackhawk is also hoping to cash in further by "going big on the e-platform," says Siromani. While a lot of people still prefer buying physical gift cards because they see them as more fun to wrap up for a kid or friend to open, e-gift cards are expected to take off next. Last year, e-gift cards made up 5% of the market. By 2017, that is expected to double, according to A.T. Kearney. Related: What are consumers buying? The new coupon: Gift cards are seen as a win for consumers because of the convenience factor. Stores love them because they not only get people to come back, but also to spend more. Stores also make a profit. CVS (CVS), for instance, keeps about $4.50 for every $100 gift card you purchase in the store, says Murphy of Standard Life Investment. Blackhawk also gets $4.50. That means that if you bought a Best Buy (BBY) card, it is only getting $91 of that $100. But it's still a good deal for Best Buy or any other retailer because when people come into stores to use their gift card, the vast majority are spending well over the value of the gift card. "Everyone is happy at the end of the day," says Murphy. The next frontier for gift cards is to replace coupons. If you spend $50 in a store, they might give or mail you a $5 gift card. That way a store like Target (TGT)is incentivizing shoppers to come back again. "It feels like free money, but you have to go back in and spend it," says Jenny Parris, the head of global marketing and product for Stored Value Solutions, which runs gift card programs and promos for large retailers. Coupons only have about 10% redemption rates, says Parris. The typical redemption for a gift card promo is over 50% and can sometimes go as high as 80%. Editor's note: An earlier version of this story underestimated the number of gift cards purchased in the U.S. last year.